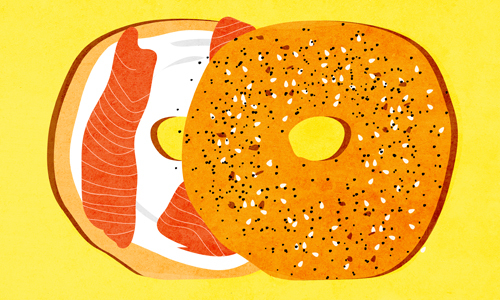 Why Do Jews Eat Lox and Bagels? I didn’t really grow up what you would call religious, but we always had a family tradition of eating bagels with lox and cream cheese on Sundays. Even now, there is a synagogue that I pass from time to time that advertises Sunday morning classes with a “lox and bagels bonus.” What’s with Jews and lox and bagels and Sundays? Also, people sometimes use the term “lox-and-bagel Jew,” and I couldn’t figure out whether that was a positive or negative term. Can you help shed some light on all of this? Thanks! I always thought that lox and bagels on Sunday mornings is as “Jewish” as apple pie is “American.” Except for crabapples, apples aren’t native to the United States, and neither does smoked salmon in a sandwich seem to be deeply Jewish. Legends and theories surrounding the origins of the bagel abound,1 I but will mention just one. In the 12th and 13th centuries, it was quite common for Jews to be banned by law from commercial baking. This stemmed from the belief that since Jews were enemies of the Church, they should be denied bread, which has a central role in Christian religious belief and practice. In any event, the bagel gained popularity among Eastern European Jews, and by the time they emigrated en masse to the United States at the turn of the 20th century, the bagel rolled right along with them. The Jewish affinity for salted or smoked fish is based on a number of factors. Second, unlike meat, which has many requirements for slaughtering and preparing it in a kosher fashion, you can buy a whole kosher fish from a non-Jewish store. Third, smoking or salting the fish minimized the need for refrigeration. Before there was lox, there was herring. It was only once the Jews emigrated to the U.S., and salmon was relatively cheaper and easier to come by than herring, that lox became a favorite. So, despite the fact that the word “lox” comes from the Yiddish “laks” (“lachs” in German), as far as I know there is no known special Jewish connection to it prior to the early 1900s in the United States. Although many view the term as referring to one who has no connection to Judaism other than eating bagels with lox on Sunday, I think this term also has a positive connotation, for it highlights the fact that even assimilated Jews retain a connection to their Jewishness. It may just be a cultural connection to them, but it stems from their forebears’ efforts to keep the kosher dietary laws in a new land. The bagel has even played a part in revealing the purpose of creation. There is a well-known chassidic story that Rabbi Schneur Zalman of Liadi (the Alter Rebbe) was once learning with Rabbi Avraham “the Angel” (son of the Maggid of Mezeritch).5 While learning, Rabbi Avraham reached such a deep state of soulful longing for G‑dliness that his soul was about to leave him. Thinking quickly, Rabbi Schneur Zalman forced his friend to eat a piece of bagel with butter to bring him down to reality, and “the Angel’s” life was saved. The Lubavitcher Rebbe, Rabbi Menachem M. Schneerson, of righteous memory, remarked that in recording and transmitting this story, chassidic tradition included the “trivial” detail that the lifesaving food was a bagel with butter, but neglected to even tell what lofty subject prompted “the Angel” to almost leave his body. So the next time you savor the taste of a bagel, no matter the topping, remember that our purpose in this physical world can be revealed even in a humble bagel. Perhaps the most famous one is about the people of Vienna baking bagels in order to pay tribute to the king of Poland, who successfully repelled the invading Turkish armies in 1683. The story goes that since King Jan Sobieski was famous for his love of horses, the bakers decided to shape their dough into a circle that looked like a stirrup—or beugel in German. See, however, The Bagel: The Surprising History of a Modest Bread (Yale University Press, 2009), where author Maria Balinska proves that for the most part this story is a myth. Ari Weinzweig, “The Secret History of Bagels,” The Atlantic, 26 March 2009; Maria Balinska, The Bagel: The Surprising History of a Modest Bread (Yale University Press, 2009). Leo Rosten, The Joy of Yiddish; Balinska, The Bagel, ch. 3. Gil Marks, Encyclopedia of Jewish Food (Hoboken, NJ: Wiley, 2010), p. 36. For more on this, see the Rebbe’s talk on Shabbat Parshat Metzora, Shabbat HaGadol, 10 Nissan 5746 (1986). Why Don't Jews Have Open-Casket Funerals? Why Is Tu BiShvat in the Winter? Why Do You Learn Kabbalah Before the Age of 40? Why Do We Smell Aromatic Spices? Why Do Jews Carry in an Eruv on Shabbat? Today I heard that we are supposed to eat bagels after a funeral, since I have never heard of this before does anyone know if and why this is so. lox for everyone I love this topic. To the writer Todah. We too are Sephardi Jews and we do eat Lox and Bagels--we are of European decent. Ken, it is true that not all Sephardi will mix fish with anything of dairy, but, we do know the dietary laws is in fact No fish and meat. To the person putting down the writter, know your history. Israel became Israel again through the children of Shem-Israel- European Hebrews and many from New York. The plans were already set for us to return home--especially after the holocaust--so don't lie- The Jews of Israel-came from Europe--then some later mix with the Palestinians or what was there from Babylon-children of Ismael or Ham(Canaan)--Know Torah too it is there. Genetically Modified [Organism] can mean almost anything to anybody. Cross-breeding like with like (soybeans with soybeans--lecithin) seems to be kosher (ask the Rabbi). Early generations searched their fields for wheat strains with desirable qualities and cross-pollinated them. Today's GM may still be like with like. The technology uses gene sequencing. Pest-resistant genes of a soybean may be inserted into the best soybean strains that we have already been eating. This is like what the ancients did except several orders of magnitude more efficiently. These may not breed true, or may be infertile. Back to the "drawing board." Or Monsanto (to cite a notorious company) sells the seeds each year and prohibits farmers from seed saving, as farmers have always done. Legal, but I don't consider this ethical. Nothing is tested to check for allergies, let's say. Again legal, but dangerous. Bagels and lox were more Sephardic than Ashkenazi to me... I grew up in a "mixed" household: Dad was Galitzeannah. Mom's mother was Ashkenaz, but her father was Kosturian Sephardic, and my grandparents' household was pretty much Sephardic. *They*, not my parents (or my dad's mother) were the bagel eaters, the lox eaters, the bagel-with-cream-cheese-and-lox eaters. The Ashkenazic synagogue I went to sent everyone home for meals after b'nai mitzvot, Simchat Torah, etc. ; the Sephardic synagogue my grandparents went to had lavish spreads of smoked fish (multiple types), bagels, cream cheese, and butter. Bagel - Beigl It has allways puzzeled me that the jiddish word Beigl (Bejgl?) is called bagel in english. I suppose it is called so because the word bagel is pronounced just like the jiddish word which maybe was too difficult for the Americans ! But when Beigl is the same in singular and plural you use bagel-bagels in english.It is a little bit confusing. Lox & Bagels are good!